Last month in our Fresh Fork basket we received some Stanley plums (aka “Italian plums”). I had no idea how I was going to use them and I knew that my husband wouldn’t eat all of them as I am the pickiest of picky when it comes to fruit. No, really. The list of fruits I don’t like is much longer than the list of fruits that I actually do like. Granted, I’ve come a long way from my childhood where I would eat only apples, grapes, and raspberries – but I still have a ways to go. We were invited to my inlaws’ house one night for dinner back in September and I needed to throw something together last minute to bring along and share. 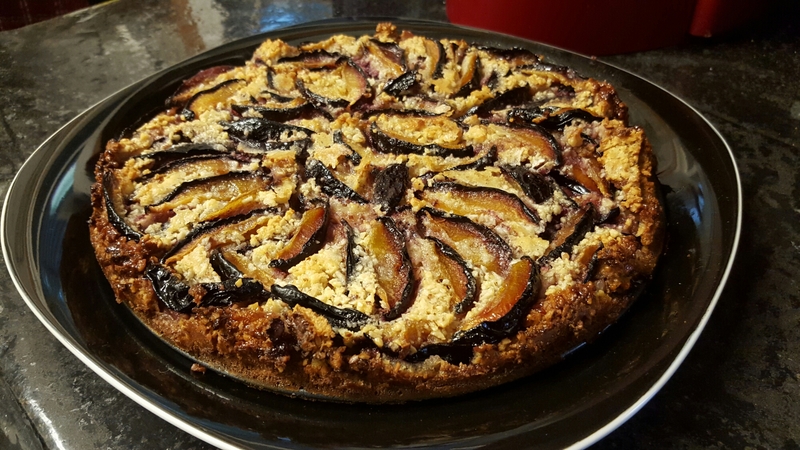 I settled on this plum cake, as I haven’t really cooked much with fruit and needed to use these plums. Plus, my husband loves cake – so why not? Preheat the oven to 350ºF. Butter the surface of a 10-inch tart pan or springform pan. Put the almonds and 1/2 cup sugar in a blender or food processor and pulse until the nuts are finely ground. Add the flour and salt and pulse once more. Transfer the mixture to a bowl. In a separate bowl, whisk the eggs and milk together. Stir in the melted butter. Add this mixture to the bowl of dry ingredients and whisk until the batter becomes nice and smooth. Pour the batter into the pan and smooth with a spatula. Arrange the plum slices on top on a circular pattern. Sprinkle sugar generously over the plums. Bake for 40 to 45 minutes, until the top is golden and a pairing knife inserted into the center comes out clean. Serve warm, with a scoop of vanilla ice cream if desired. This cake was, for lack of a better word, devoured. There was not a piece left to take home and a pint of ice cream was a perfect accompaniment to the cake. The almonds and sugar take the sweetness of the plums to the next level…and well, who doesn’t love cake? I was very proud to have made a dessert that was a win with not only family but myself included! I intend to make this again next fall when Italian/Stanley plums are in season. As you saw from the first CSA of the summer, I received a bundle of rhubarb and had no idea what to do with it. After a bit of thinking and a purchase of a quart of strawberries from the market, I decided to go with the ‘strawberry-rhubarb’ route and make a dessert. I know, I know – desserts on this blog are (sadly) few and far between. I decided to research crumbles and crisps to see what I could come up with, especially with not having a lot of ‘extra’ ingredients on hand in my pantry. All I needed to buy for this recipe was some quick oats – and since I needed to go to the store to get coffee anyways, I could easily get my hands on the exact amount I needed from their bulk ingredient section. We all know I have to have my coffee…so I consider this a win. ANYWAYS – here’s a dessert for anyone who is holding on to the tail end of strawberry and rhubarb season tightly. I admit, it does have a lot of sugar in it…but it’s well worth it when it’s all done baking. Make the topping: Combine all of the topping ingredients into a medium bowl. Use the dough hook on your KitchenAid mixer, a pastry blender, or your fingers, to mix everything together until large crumbs form. You CAN make this a day ahead of time and refrigerate overnight; make sure you bring it to room temperature before using. Preheat the oven to 375*. In a bowl, toss the rhubarb and 3/4 cup of the sugar, and let it stand for 15 minutes (stirring occasionally). In another bowl, toss the strawberries with the remain 1/2 cup sugar and let stand for 10 minutes, also stirring occasionally. Using a slotted spoon, transfer the rhubarb to the strawberries and discard any rhubarb juice. Add the rest of the filling ingredients and stir to combine. Transfer the mixture to a 9×13 glass baking dish. Sprinkle the crumb topping evenly over the filling and bake for 30 minutes. Then, turn the temperature down to 325* and bake for an additional 25-30 minutes. The filling should be nice and bubbly and the topping browned. Remove from oven and let the crisp rest for at least 10 minutes before serving. This dessert really hit the spot on a warm, humid summer night. 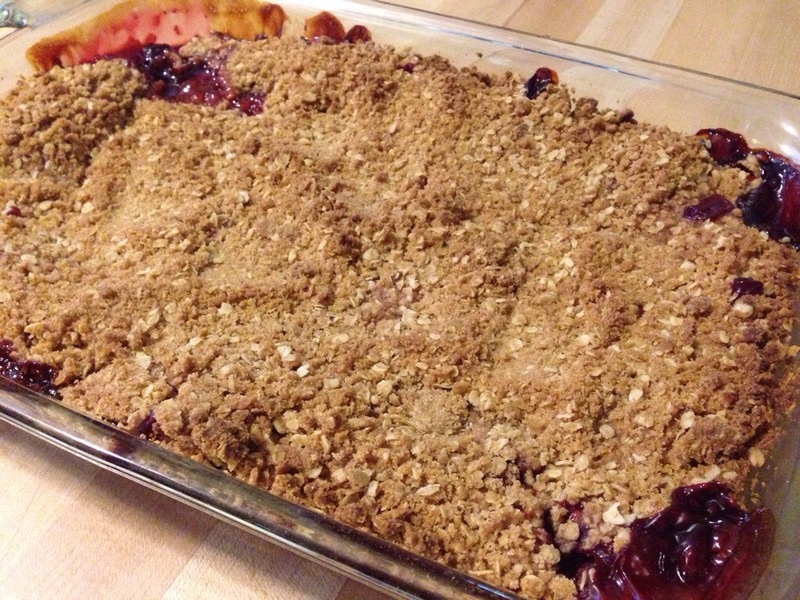 It’s not the most healthy dessert out there, but it’s great for a crowd or cookout. Don’t let the rhubarb scare you, either – there’s enough sugar in this recipe to cut the tartness. If the texture of rhubarb bothers you, make sure you chop it into small enough pieces. As Step #6 states – you have to eat it with vanilla ice cream. It just isn’t the same without (trust me, I tried). You’ll be glad you did!